Pulled Barbecue Chicken is just as tasty as barbecue pulled pork. 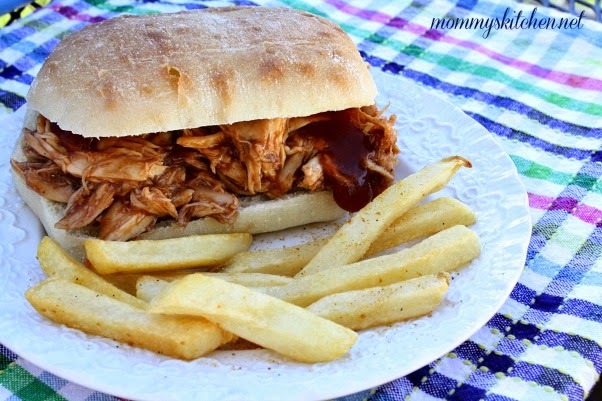 This pulled barbecue chicken comes together easily and is cooked low and slow in your crock pot. We eat a lot of chicken in our house, so finding new recipes can sometimes be a challenge. I usually stick to my regular rotation meals, but that can tend to get a bit boring. I love cooking whole fryers (chickens) in the crock pot, because they're usually the cheapest in price when it comes to chicken. Costco seems to have the best price for whole fryers at $1.09 lb. They're sold in two packs, so I usually grab a few and toss them in the freezer. 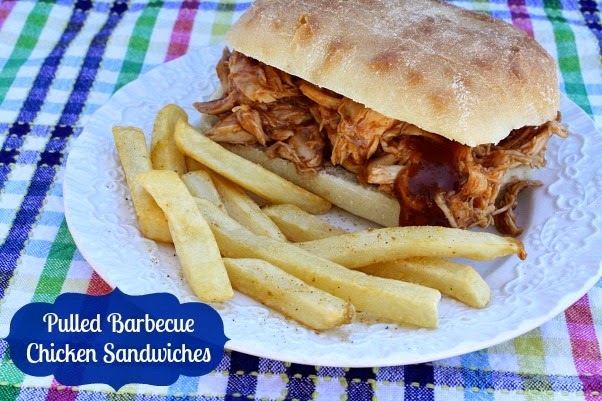 Whole fryers are perfect for chicken & dumplings, soups, stewed chicken, chicken spaghetti, baked chicken, and these yummy Pulled Barbecue Chicken Sandwiches. This pulled barbecue chicken is super easy to prepare. Just season the chicken and toss it in the crock pot and let it do it's magic. You really can't go wrong with tender chicken in a sweet tangy barbecue sauce. I for one love barbecue anything, so this is one of my favorite crock pot meals. This recipe makes quite a bit, so it's perfect for a crowd or use the leftovers to repurpose into a new meal. This chicken is great to make barbecue chicken pizza , barbecue chicken and cheddar Quesadillas, barbecue nachos, a filling for crescent rolls, or as a topping for baked potatoes. Lets get started with the step by step. These are the ingredients you will need: one whole chicken (about 4-5 lbs), one small onion, your favorite barbecue dry rub, onion powder, garlic salt, pepper (not pictured). barbecue sauce, liquid smoke and honey. Start by rinsing the chicken under cold water and remove the giblets. Pat chicken with a paper towel inside and out. In a small bowl mix together the onion powder, garlic salt, pepper and barbecue dry rub. Coat the entire chicken with the dry seasoning mix including the inside cavity and a under the skin of the breasts. Place the chicken in a large zip lock bag and refrigerate for at least 6 hours or overnight. Remove chicken from refrigerator and place in a 6 quart crock pot. Scatter the sliced onions on top and around the chicken. Add 1/2 cup barbecue sauce over the top and cover and cook on high for about 4 - 4 1/2 hours (or until the chicken is fully cooked). Transfer cooked chicken to a cutting board and pull the meat off the bone. Shred the chicken using two forks and return the chicken to the crock pot (remove any bones or grease in the crock pot and wipe clean). In a small bowl mix together 1 1/2 cups barbecue sauce, honey, and liquid smoke. Pour the mixture over the shredded chicken and mix to combine. Continue cooking until the chicken mixture is warm throughout. Serve immediately on a hoagie or sandwich rolls with additional barbecue sauce, onions, pickles, and your favorite coleslaw if desired. Rinse the chicken under cold water and remove the giblets. Pat chicken with a paper towel on the outside and inside the cavity. In a small bowl mix together the onion powder, garlic salt, pepper and barbecue dry rub. Coat the entire chicken with the dry seasoning mix including the inside cavity and a under the skin of the breasts. Place the chicken in a large zip lock bag and refrigerate for at least 6 hours or overnight. Remove chicken from refrigerator and place in a 6 quart crock pot. Scatter the sliced onions on top and around the chicken. Add 1/2 cup barbecue sauce over the top of the chicken. Cover and cook chicken on high for 4-5 hours (or until chicken is fully cooked). Transfer the cooked chicken to a cutting board and pull the meat off the bone. Shred the chicken using two forks. Discard the bones and grease at the bottom of the crock pot and wipe clean. 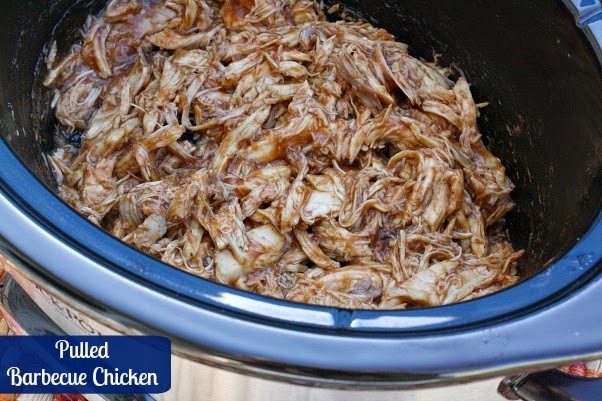 Return the shredded chicken to the crock pot. In a small bowl mix together 1 1/2 cups barbecue sauce, honey, and liquid smoke. Pour the mixture over the shredded chicken. Mix to combine. Continue cooking until the chicken mixture is warm throughout. Serve immediately on hoagie or sandwich rolls with additional barbecue sauce, onions, pickles, and your favorite coleslaw if desired. Oh, that certainly looks delicious! Looking Good. Here, we just finished having pulled pork sandwiches. I must say; I kinda take the easy route and use a Rotisserie chicken. Tina, this looks like a great recipe to add to my weekly rotation. Can't wait to try it out. I haven't tried adding liquid smoke to my crock pot BBQ recipes. GENIUS. Thanks for sharing, cheers! @Danielle, I hope you like it!!! @Colleen, I love using Rotisserie Chickens to make homemade chicken soup. I pull off all the meat and boil the whole chicken carcass along with (a bay leaf, celery, pepper and poultry seasoning). It makes the most wonderful rich broth. Thanks for this yummy recipe.I tried it last night it came really so yummy and delicious.I must say the way you explain and the image are really help me lot to prepare.